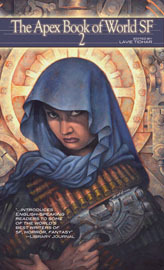 Read Lauren Beukes’ “Branded” From the Apex Book of World SF 2! Over at io9, we have Lauren Beukes‘s short story, Branded, available to read – one of the 26 stories now available in The Apex Book of World SF 2. Check it out and consider buying the anthology – direct from the publisher or via Amazon or Amazon UK! We were at Stones, playing pool, drinking, goofing around, maybe hoping to score a little sugar, when Kendra arrived, all moffied up and gloaming like an Aito/329. “Ahoy, Special K, where you been, girl, so juiced to kill?” Tendeka asked while he racked up the balls, all click-clack in their white plastic triangle. Old school this pool bar was. But Kendra didn’t answer. Girl just grinned, reached into her back pocket for her phone, hung skate-rat style off a silver chain connected to her belt, and infra’d five Rand to the table to get tata machance on the next game. But I was watching the girl and as she slipped her phone back into her pocket, I saw that telltale glow ‘neath her sleeve. Long sleeves in summer didn’t cut it. So, it didn’t surprise me none in the least when K waxed the table. Ten-Ten was surprised though. Ten-Ten slipped his groove. But boy kept it in, didn’t say anything, just infra’d another five to the table and racked ‘em again. Anyone else but Ten woulda racked ‘em hard, woulda slammed those balls on the table, eish. But Ten, Ten went the other way. Just by how careful he was. Precise ‘n clipped like an assembly line. So you could see. – continue reading!